The 30th anniversary of the nuclear disaster at Chernobyl is being commemorated in Ukraine. Even now, decades after the meltdown, the impact of the explosion at reactor 4 of the Soviet power plant is still being debated. Indeed, efforts to contain and secure the stricken plant are ongoing. A vast exclusion zone remains in place, 30km in radius. However, this is now a nature reserve, and reports indicate that wildlife is returning to the area. But despite this surge in wildlife, the area remains contaminated and a huge quantity of radioactive material remains in the destroyed reactor. Questions over safety inevitably still exist, but how significant are the risks? A power surge caused a huge explosion at the nuclear plant in Chernobyl, causing the roof of reactor 4 to be blown off in the early hours of 26 April, 1986. Large quantities of radiation were released into the surrounding area, and indeed over much of Europe. The radioactive cloud forced tens of thousands of people from their homes, and a 30km exclusion zone around the reactor remains in place. Following the disaster, the Soviet authorities rushed to build a concrete sarcophagus over the reactor. However, the structure was only intended to last for 30 years, and so as it deteriorates, the need to replace it becomes increasingly urgent. According to the BBC, some 97% of the reactor’s radioactive material remains inside. The risk of further radioactive material being released into the environment is therefore very real, and the authorities have reacted to contain, and ultimately, deconstruct the reactor and its core. The solution? The largest moveable, land-based structure ever built – according to the organisation behind the project, the European Bank for Reconstruction and Development (EBRD). The New Safe Confinement (NSC) has been under construction since 2010, and is set to be completed by 2017. The challenges posed by building such an enormous structure, so close to such a dangerous and contaminated site, are understandably considerable. The arch-like building is being constructed next to the reactor, and will be moved into place once complete, in a manoeuvre expected to take several days. Capable of withstanding a tornado, equipped with a ventilation system to prevent corrosion, the structure is expected to last at least 100 years. More importantly, the dome will allow work to begin on dismantling the reactor, and removing the radioactive material. As this drone footage from the site shows, the scale of the project is vast. The completed structure will weigh more than 30,000 tons and be tall enough to cover St Paul’s cathedral. 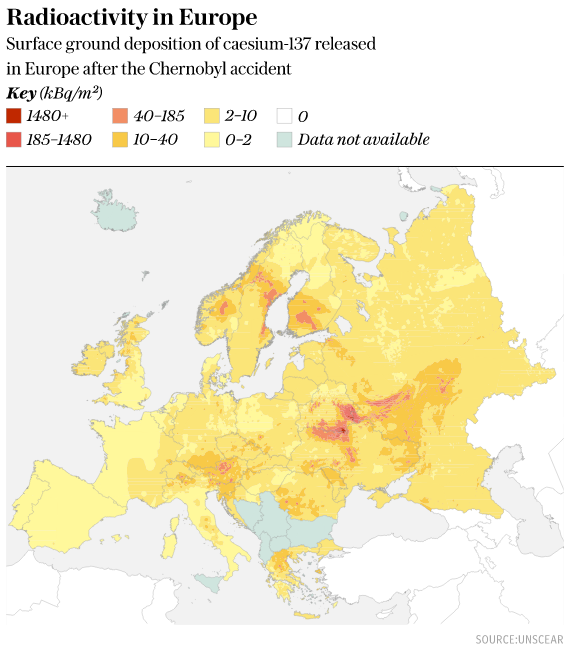 The sheer quantity of radioactive material released into the environment, and remaining in the reactor, make Chernobyl a highly dangerous environment. However, the NSC is hoping to make the destroyed reactor safe long into the future.